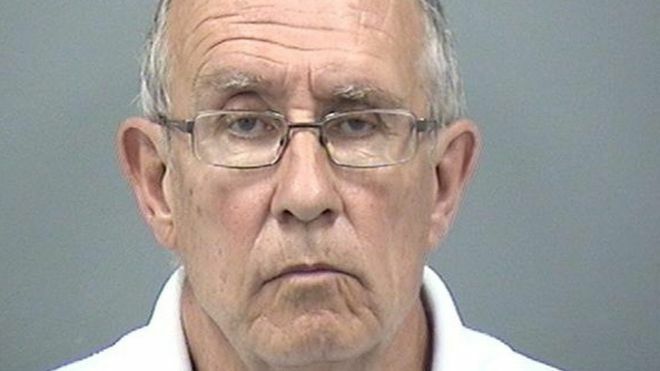 A former scout leader has been jailed for nine years for abusing boys over a 41-year period. Paul Cherrett, 62, of King Richard Drive, Bournemouth, admitted 18 charges including indecent assaults and possessing indecent photos. The offences, against nine boys between 1975 and 2016, took place at Scout camps and other locations. The judge at Bournemouth Crown Court said Cherrett's crimes would live with his victims forever. The court heard Cherrett's offending was finally discovered when a CCTV camera was triggered by a motion sensor in the tuck shop at Butchers Coppice Scout Camp in Bournemouth. The camera sent alerts including still images to a senior scout leader's mobile phone. The CCTV images showed Cherrett acting inappropriately with a boy. It led to a charge of sexual activity with a child, which Cherrett admitted in August 2016. Following a police appeal, a further eight victims came forward, leading to another 17 guilty pleas on Friday. The court heard boys were sexually abused and forced to stand naked at Scout locations in the Bournemouth area and at camps abroad. Police also found 35 indecent images of children on Cherrett's computer equipment. Judge Peter Johnson said: "Some of your victims were as young as eight or nine. You caused them immense harm." The Scout Association said Cherrett had always held a "full and valid" Disclosure and Barring Service (DBS) check. Spokesman Simon Carter said: "Neither we nor the police hold any records relating to his service with the association that showed that previous allegations had been made detailing any inappropriate behaviour. "